Of course I'm fortunate to have sailed 95% of the time with upper-end companies on smaller ships and have been supremely well looked after, with the result that I have inevitably become a snob about such things and do a muted Geraldine whenever one of the big ships comes to town. The thought of being imprisoned on a floating artificial city with 5,000-odd other bods is total anathema to me. Radiance of the Seas? Absolute hell. But. 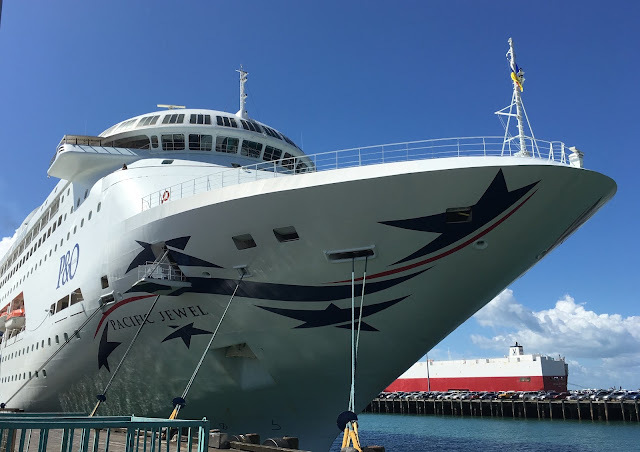 Being at a loose end, and naturally flattered anyway to be asked, on Wednesday I went aboard P&O's Pacific Jewel for a bit of a junket to promote their upcoming The Big Laugh cruise, which will feature 22 comedy shows over three nights. It was slightly odd to be sitting in a bar, offered canapés and cocktails at midday, but we all did our best to cope, and enjoyed the sets professionally performed by three familiar comics. Now, the Jewel is not one of the bigger ships - 1900 passengers - so I wasn't challenged on that score (though it's still more than four times bigger than my Silversea ships); but it is, shall we say, more affordable than most of the cruises I've been on (officially, that is, since for me all but one were free). (Sorry.) So although it was well presented (just out of a dry-dock refurbishment) it was more smart than elegant. It was quite disconcerting to see price lists displayed at the bars - just like, in fact, being in the real world, which is not how I've ever thought of cruises. To me they've always been a bit like palaces, where everything is done for you and supplied to you at your whim, and money is never mentioned. However. People who don't drink (at all, or much) would appreciate not having that built into their fares, I'm sure. And here's the thing: it was all so friendly! The passengers wandering around exploring (this was the embarkation day for a 10 day cruise around NZ), all of the staff I encountered - everyone was cheerful and chatty and clearly pleased to be there. Silversea staff are nice too, but with an overlay of deference that means you're always aware they're at work. And some Silversea passengers can be a bit stand-offish. It was nice to see children on board too, being excited. Even the woman passenger lying in the salon having some unbelievable treatment with plaster-like stuff and wires all over her abdomen, purportedly losing inches just lying there, was relaxed and talkative with all of us wandering curiously past. And as for the route, well, the older lady I talked to in the theatre (two tiers of seating, that's something you don't see on the smaller ships) was very enthusiastic about advantages - we didn't mention the ports of call and the scenery, we took that for granted, this is New Zealand after all - in that she didn't have to bother with a passport or, more importantly, travel insurance. "When you get older, travel insurance is a KILLER!" she exclaimed (in a moderately unfortunate choice of phrase). "If I get sick on this cruise, I'll just go ashore." And she makes a good point that will be very relevant to a big proportion of cruise passengers.